Bettors love Tiger Woods. Even though he limped off the course at the Cadillac Open and did not play at Texas, the big SportsBooks in Las Vegas still had him listed as a 10-to-1 favorite to win the Masters coming up soon in Augusta, Georgia. But the Tiger has now dropped out of the Masters and his fans everywhere all know that the world’s leading golfer must have been in some serious pain to miss this above all other matches of the year. Tiger Woods turned pro in 1996 and won his first major event in April 1997… the Masters, the youngest Masters winner ever. Then Woods pulled on the famous Green Jacket again at Augusta in 2001, 2002 and 2005. He has participated in the event every year since turning pro and the Masters will just not seem the same without him. In his statement to the press, Tiger announced, “After attempting to get ready for the Masters, and failing to make the necessary progress, I decided, in consultation with my doctors, to have this procedure done.” The procedure he was referring to was a surgery to alleviate the pain he was suffering from a pinched nerve in his back. It must have been really bad to drive Woods to forgo the Masters. So Tiger’s 2014 season is pretty much a washout. He had some moments of the old Tiger early on but mostly we just saw him slicing into the crowd and wincing in pain on each shot. It was not a whole lot of fun to watch. It’s quite possible that Woods will also miss the U.S. Open this year, something else that he would rather not be left out of. As for the Masters odds, Tiger’s buddy Rory McIlroy has since been installed as the favorite replacing Tiger at 8-to-1 followed by Adam Scott and Jason Day, both listed at 10-to-1. Phil Mickelson, who pulled a muscle at Texas, is still listed at 15-to-1 along with Dustin Johnson and, coming in at 20-to-1, we find the high powered trio of Matt Kuchar, Bubba Watson and Henrik Stenson. 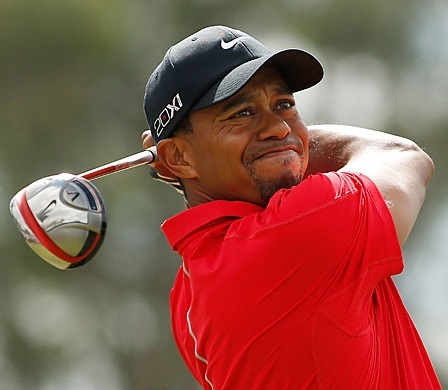 Now the surgery has been successfully performed and Tiger Woods faces months of recovery and recuperation. He has stated publicly that he hopes to be back on the links sometime this summer and his fans all around the world join together in wishing him a speedy and painless recovery and a happy return to the game that Tiger Woods has devoted his life to.